Hidden in the jungle of remote Piedras Blancas National Park in southern Costa Rica, Esquinas Rainforest Lodge is surrounded by untouched wilderness. It is a hot spot for birdwatchers and nature lovers wishing to experience the sounds and sights of a tropical rainforest in a tranquil, undisturbed atmosphere. We have 18 rooms, an exclusive jungle villa, a restaurant, a bar and a spring-fed pool. The 37-acre private reserve and the adjoining forest of Piedras Blancas National Park attract over 300 species of birds, almost 100 species of mammals and many amphibians and reptiles. By planting thousands of trees in nearby La Gamba, the lodge has been certified as 100% carbon-neutral. Esquinas is a leader in sustainability and has been awarded a Certificate of Sustainable Tourism from the Costa Rican Tourism Board. 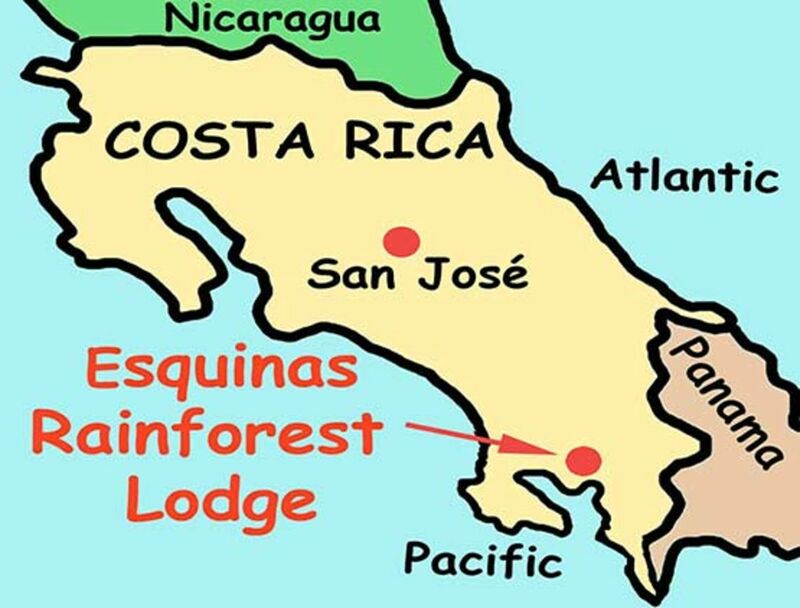 Esquinas Rainforest Lodge offers a large variety of tours and excursions that lead through a jungle with a biodiversity equal to nearby Osa Peninsula and Corcovado National Park. Activities include hiking, horseback riding, birdwatching, and boat and kayak tours in nearby Golfo Dulce. We are located near the village of La Gamba, only three miles off the Interamerican Highway and a 30-minute drive from Golfito airport. The lodge is accessible by car all year.